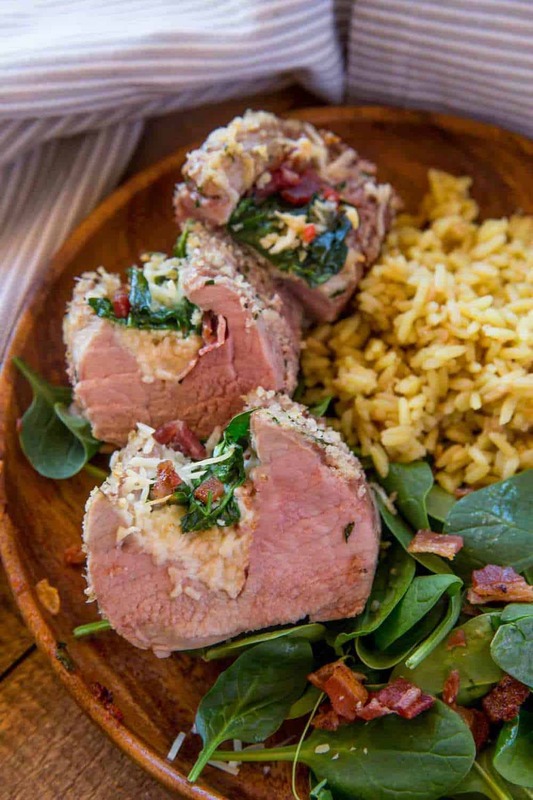 Spinach Bacon Stuffed Pork Tenderloin with Parmesan Cheese in just 30 minutes. The perfect dinner party recipe with hardly any effort needed. 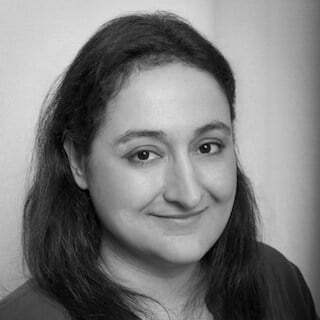 Hey guys its Sabrina again from Dinner, then Dessert! Here with a delicious, easy, fancy looking dinner that takes almost no effort at all! 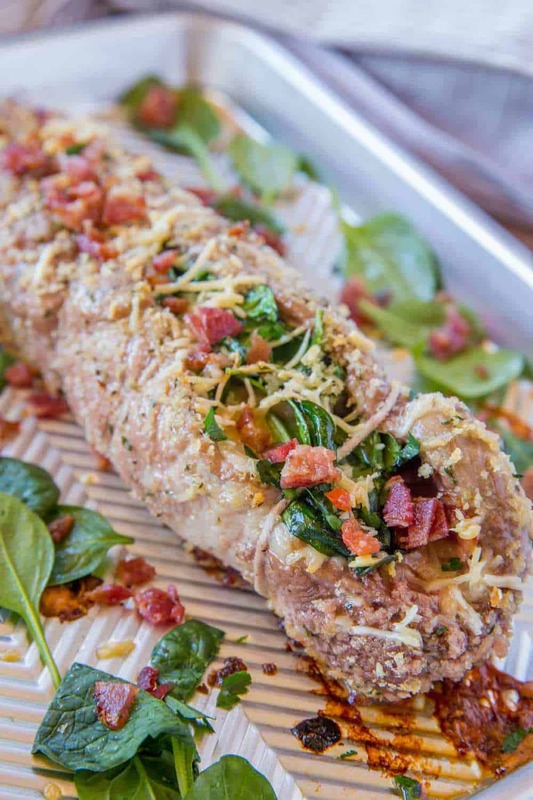 This stuffed pork tenderloin recipe is a breeze to make and all it takes is a paring knife and a few quick ingredients. Plus, you don’t even have to know how to knot a roast to keep it together, using a kitchen string here is as easy as wrapping the pork. 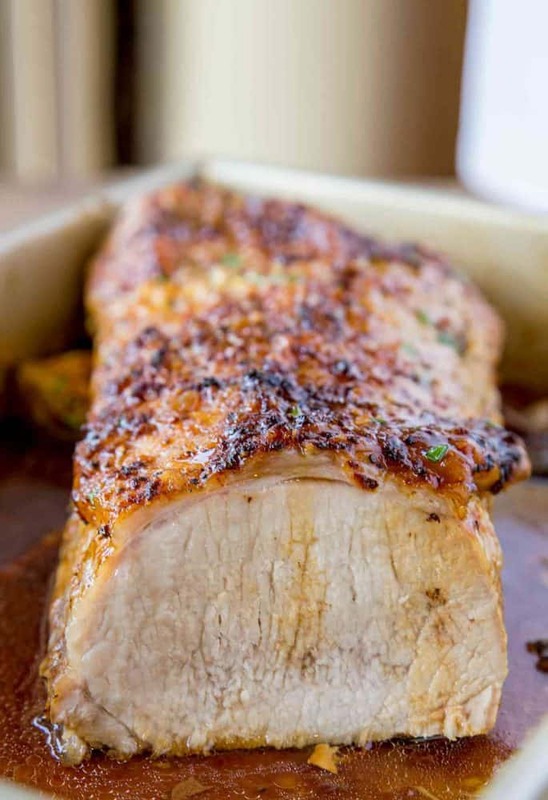 The beauty of roasting off a pork tenderloin is that it can bake in just 30 minutes and with a stuffing you help keep the roast moist in the middle and avoid drying out what some people find to be a temperamental cut of pork. 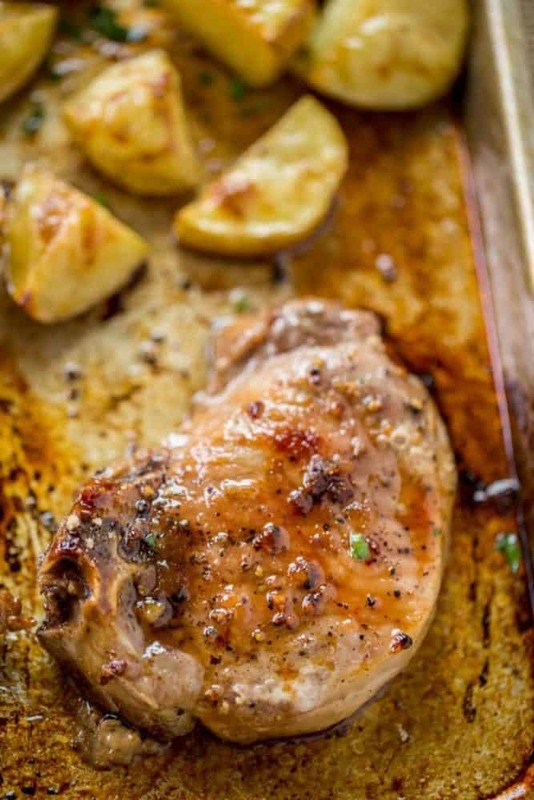 Alyssa has some great pork recipes for you all too, including Creamy Parmesan Pork Chops and Slow Cooker Bacon-Wrapped Maple Glazed Pork which is made with a pork loin (larger than this tenderloin recipe but just as easy to make). How to stuff a pork tenderloin? Slice just past halfway through the tenderloin and pull it apart. Keep the ingredients easy but flavorful and add a bit of fat (in our case cheese and bacon). Wrap the tenderloin tightly to prevent it from flattening out in the oven. (no knots needed here!). Roast at a high temperature to brown the outside while cooking quickly enough to avoid overcooking the interior. Coat the exterior in a fat and season aggressively to create a beautiful crust on the outside of the roast. Spinach Artichoke Stuffed Pork Tenderloin: 2 cups spinach, provolone cheese, 1/2 cup chopped artichoke hearts, garlic. Sun Dried Tomatoes and Spinach: 2 cups spinach, romano cheese, 1/2 cup chopped sun dried tomatoes, garlic. Mushroom Herb Stuffed Pork Tenderloin: 8 ounces of mushrooms cooked in butter with salt and pepper until caramelized, garlic, fresh thyme. Coat the pork inside and out in the salt and pepper. Add the spinach, bacon and garlic to the center of the pork roast. Wrap the tenderloin tightly with kitchen twine to prevent it from flattening out in the oven. No need to tie, just wrap then tuck the ends into itself. Rub the outside of the roast with the butter and cook for 35-40 minutes. Let rest for five minutes before slicing. Looking for more easy pork options? Great recipe and I will be making this but I don’t see any parmesan in the ingredients or instructions? How long do you Cook it at 375 degrees? 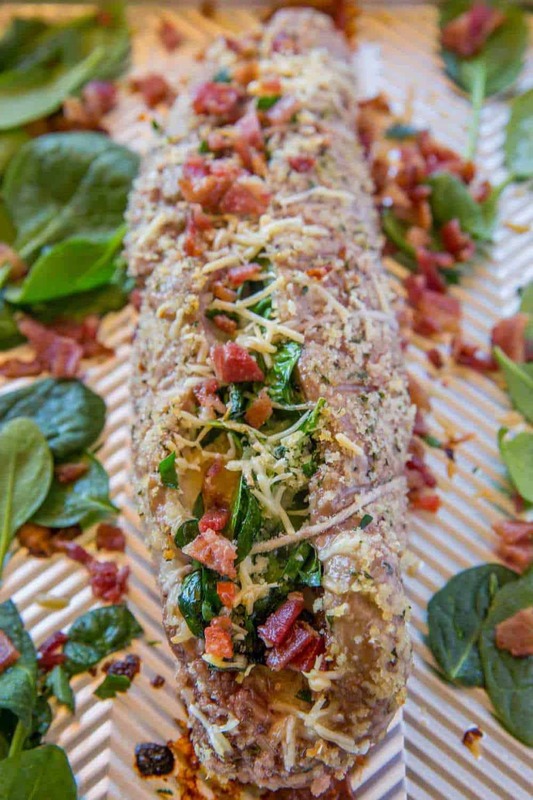 The bacon spinach Parmesan cheese stuffed pork tenderloin omits in the recipe how much cheese and how and when to use it. Please help with that. Could you add nutritional values to your recipes?